PRIMARY school teacher Margaret Hatzis had one of those “aha moments” while standing next to Mary MacKillop’s tomb in North Sydney. It was 2008 and as she was surrounded only by candlelight, Margaret looked at the holy tomb and realised her entire life – literally from the moment she was born – had been shaped by the then soon-to-be saint. She thought about how the Sisters of St Joseph, Mary MacKillop’s order, cared for her for the first six weeks of her life at St Anthony’s, Croydon, after supporting her birth mother through an unplanned pregnancy. She recalled playing guitar for Masses in the exact same North Sydney chapel when it used to be connected to a teachers’ college, where Margaret studied. She remembered the time she took her adoptive mother to Randwick in 1995 to witness St John Paul II beatify Mary MacKillop in front of thousands. She looked back on the 10 years she spent living out the mission of Mary MacKillop to educate the poor as a teacher at St Joseph’s Tobruk Memorial School, Beenleigh. She held back the tears thinking of how many novenas her family prayed, asking for Blessed Mary MacKillop’s intercession when her mum was diagnosed with bowel cancer. And she thought of how much her mother would have loved to see Mary MacKillop become a saint before she died at 67, leaving behind three adopted children and two miracles of her own. “We always thought she would have it out until she saw that day (Mary MacKillop’s canonisation) but she never did,” Margaret said. Filled with grief from her mum’s sudden death, which happened just before Margaret’s epiphany at Mary MacKillop’s tomb, and this new-found realisation of the Blessed’s impact in her life, an unexpected thing happened. She started to write music about Mary MacKillop and the lessons and legacy she left behind. “In my grief and making connections and trying to find a way to find joy again, this music started,” Margaret said. Margaret would be on a walk and, out of nowhere, a tune would pop into her head. Sometimes a lyric came to her at three in the morning and she would “sing it tired into the phone”. None of the songs were ever planned, but they were always the fruit of prayer. And she always prayed for help from Mary MacKillop and the Holy Spirit. “It definitely came from a prayerful space,” Margaret said. The writing process came quickly for Margaret – by 2010, the year of Mary MacKillop’s canonisation – the songs for a potential album were complete. But despite having the songs and music laid out, and even recordings of her students who crowded into her lounge room to sing possible backing tracks, it took Margaret six years and a push from the Josephites to get her into a studio. “With the Josephites’ 150th anniversary, we had a high tea and hosted this for all the Josephites that could make it to St Joseph’s (Beenleigh),” Margaret said. Impressed with her repertoire, the sisters asked Margaret if she had thought about recording her music. “They put me in touch with somebody who they had worked with before and I recorded, and it was awful, and I cried. 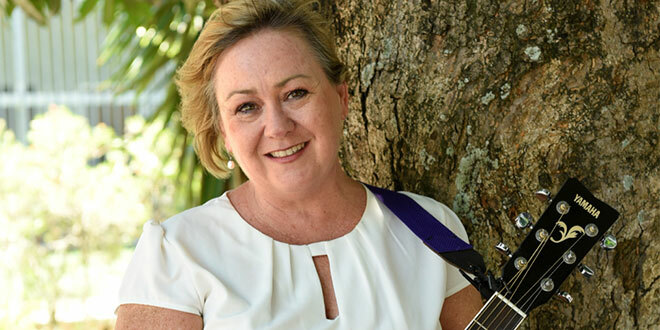 After a disastrous first attempt, Margaret found a redemptive moment at Mother Teresa Catholic Primary School, which had invited renowned children’s musician Andrew Chinn for a workshop. Andrew passed on contact details for musical-theatre composer and producer Drew Lane, who has also released his own Christian music. He agreed that the music was great, but not so much the recordings. “He sat with me and we talked and recorded my bit and talked about the field songs,” Margaret said. “I had all the songs in my head, recordings from my lounge room, and demo recordings with students recorded ten years prior. “He could hear what it was supposed to sound like. After several trips back and forth between Melbourne for recordings, and many email correspondences later, Margaret launched her first CD on February 9 at St Joseph’s, Beenleigh. “It’s taken me ten years to bring it to fruition but it brought me from my grief into a time of joy and that’s why it’s entitled Great Joy, because I found that through music,” she said. She hopes her mother is in Heaven with Mary MacKillop, “overjoyed” at her daughter’s first CD. “She’d be so proud,” Margaret said. The Josephites hope to make the CD available to all their schools across Australia as a way of bringing to life St Mary of the Cross MacKillop’s story. Margaret said Mary MacKillop’s legacy had come full circle in her life with the friendships of two Josephite Sisters, Sr Jenny Scari, who is pastoral carer at St Joseph’s, and Sr Annie McGuire, who works in prison ministry. “To be friends with those people in real life living the ministry, it’s humbling to have those sorts of people in your life to bring you to ground,” she said. Margaret is determined not be “a one-hit wonder” and is already planning and praying about her next albums under her own business, With My God (WMG) Music. She’ll have one dedicated to Mary, Mother of God, another for St Patrick – the patron of her Beenleigh parish – and Mother Teresa. “All the saints that are in my life,” she said. Great Joy is available from Margaret Hatzis by emailing mhatzis@bne.catholic.edu.au.